On Saturday, I was driving across town when a newspaper vendor standing at an intersection caught my eye. He was holding a stack of the Saturday Nation – one of the city’s leading papers. The huge cover story so piqued my interest that I quickly shuffled for some change while rolling down my window, inching forward so as not to hold up traffic for too long. Below is a scan of that front page. It was all I could do to keep from reading it while I was driving. What kind of bonus did the author predict? What did Kenyans expect from the future president of the United States? Senator’s win was a triumph, but don’t expect charity from him, warns Raila. The article itself is quite long – the whole second page of the paper expanded on the opening statements. Initially I was reassured to hear the warning from Raila (current prime minister). However, the more I thought about it, the more disturbed I became. 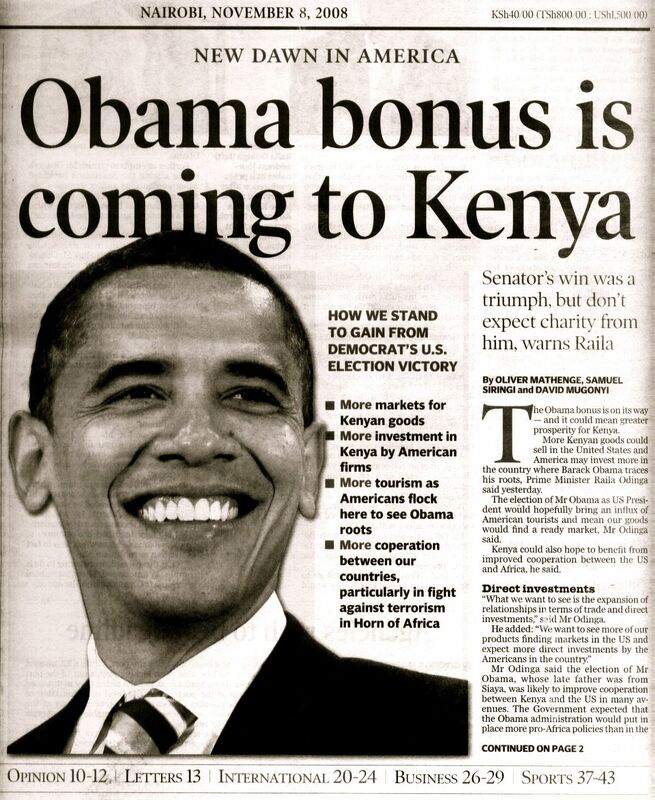 Why should Obama’s victory mean a bonus for Kenya? What about an Obama presidency would attract firms to invest here? Why would Americans become curious about his Kenyan roots when he never lived here? Is not the fact that he was abandoned by his father actually cause for shame? And what about an Obama presidency opens up the market for Kenyan goods? What kind of goods? Tea and flowers – which the rest of the world buys in bulk already anyway? Or wood carvings and kikoy cloth – which other countries in the region also produce and which do little to support infrastructure development? I understand the pride of affiliation, but I do not understand the sense of entitlement. “Our fortunes are about to change because a son of our brother now rules the world.” Not because we have worked for the income or earned the respect, but because people will now look at our “family” differently. Would not the investment from American firms come if the government was just and honest? Currently they rank in the top ten most corrupt countries in the world. Would not tourism spike if they fixed the roads and dealt with crime? Nairobi’s nickname is “Nairobbery”, and there is a 12’x4’x1′ pothole at the end of my street – the first of many I have the twisted joy of maneuvering as I make my way around town. And would the market for Kenyan goods not increase exponentially if those in leadership rewarded expertise and pushed for a level of quality that would make them competitive, particularly in the region? 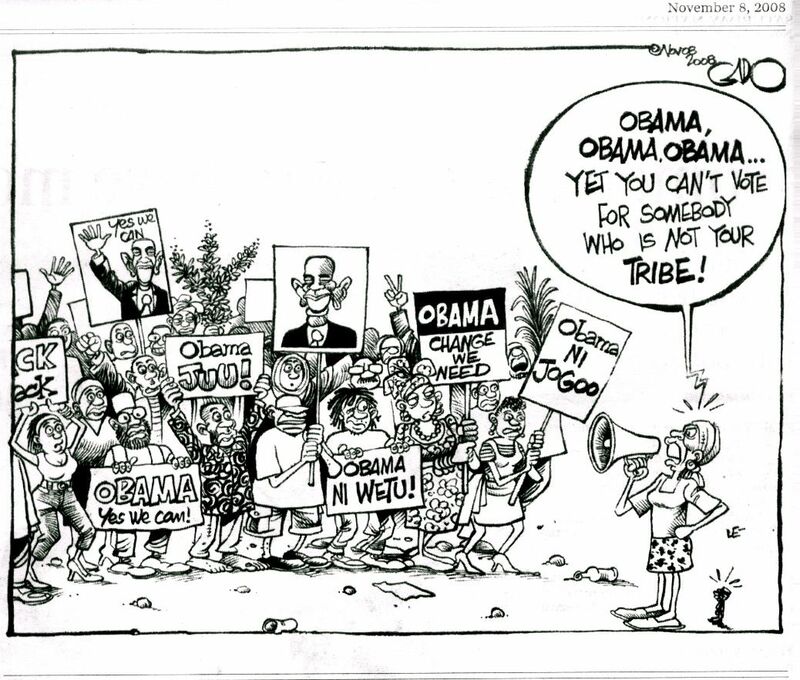 To continue in this economic vein, I have discovered a sad paradox in Kenya’s blind support of Obama. Most Kenyans don’t realize that the previous two Bush administrations, for all their many failings, have done more to promote development in Africa than any previous US administration. That is likely to change under Obama and not necessarily for the better. With the current economic crisis, and Obama’s stated intention to increase funding for programs at home, aid to Africa is very likely to decrease, family ties notwithstanding. In the United States, Obama’s victory does indeed represent a major milestone in the struggle for racial equality. It was achieved, not by Obama alone, by Americans who chose to vote across racial lines. It was not the force of the African-American vote that won him the presidency, but the combination of African-American, White, Hispanic and Asian votes; Christian and Jewish and Muslim votes. Yet, Kenyan pride at having “their man” in office misses this point entirely. “Look at what he achieved! And as a black man!” But how did he achieve it? Not on his own, not by the black vote alone, and certainly not by displacing hundreds of thousands of Republicans from their homes. That the cartoon was printed in the same paper as the lead article tells me that a few Kenyans understand the irony of their position. For those expecting the Obama Bonus, I hope that the future does not bring bitter disillusionment. Instead, may the country recognize the potential of its own people and discover the breadth of possibility in cross-cultural cooperation. i also thought it was interesting the level of attachment they have for obama when it doesn’t seem reciprocated…lucky you had a day off! cuz no one in the US did, not even to vote ;). great post Lillis. I agree that it is rather bizzare that Kenyans think that they have an entitlement given the results. And yes, it’s not just African-Americans that voted for Obama… it’s amazing how many people miss the point of looking beyond race! That concerns me. I’ll give them increased tourism, as I hear that’s already started to happen, but the other bits- he’s just not that in touch with his roots, and can’t afford the appearance that he is being favorable- especially since he ran against the Spoils System more than any other recent candidate. One of his first actions was to ban lobbyists from the White House. I fear that Kenyans are setting themselves up for a great deal of disappointment on this.So, do you find Kenya struggling politically and in infrastructure more than Morocco?